Have you ever seen a piece of art or any decorative accessory for that matter that you absolutely loved, but didn't buy it? And did you continue to think about that piece even after you left the store? And then have you ever seen that piece again and still didn't buy it for whatever reason? This was me up until last weekend. To be honest, I'm in Home Sense on a weekly basis. So, I'm pretty up-to-the-know on the latest things that come in there. And to be fair, you really need to be there every week, if not every few days, to score the best items. Over a month ago on a typical trip to Home Sense, I spotted an art piece of a horse. It was beautiful - unique, oversized, classic. I wanted it. Desperately. But, it was over my price range, so I walked away. And I thought about it. And I thought about it. And then I saw it on another shopping trip. And walked away. And thought about it. And thought about it. And then I saw it on another shopping trip - I think you get the idea. This had been going on for well over a month. Crazy, right? I'm sure you're thinking "just buy it already!" Well, I did. Last weekend. And I'm thrilled! I was in Home Sense on Saturday doing some errands for a client, and I saw it again. So, I danced around the idea yet again - "It's too expensive - I can't buy it. But, it's still here! And when you see something you like at Home Sense, you need to buy it!" So I convinced myself to bring that sucker home. Not only because it's beautiful, but basically because it still being there for over a month was a sign that it belonged to me. So, it was my duty to give it a home! We want to eventually put hardwood in the staircase and upper hallway, and paint over the builder beige. We also want to swap out the existing light in the upper hallway with a potlight, and add two more potlights at the same time. And this horse will complement that space perfectly (once we get to those changes down the road). 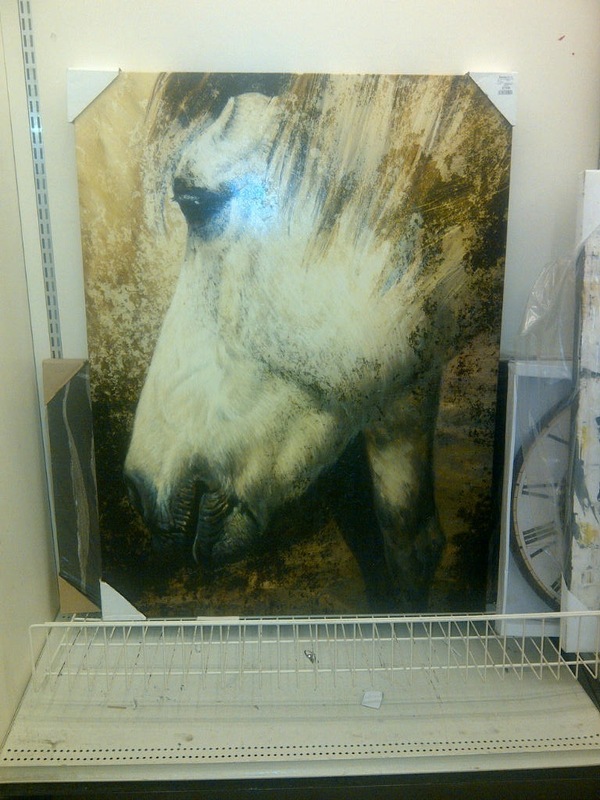 I love your artwork from Homesense! 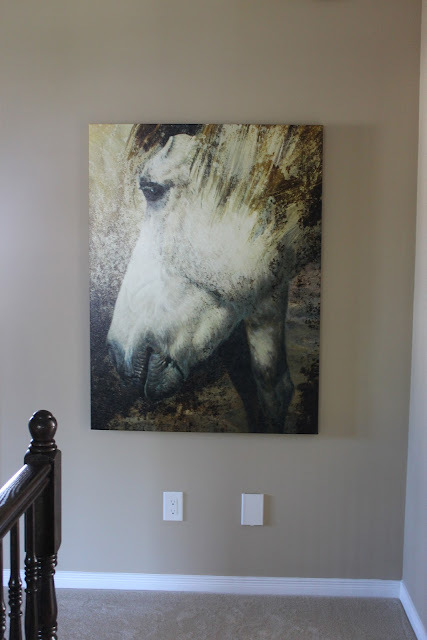 In fact, I did miss out on a horse painting last year and I've been kicking myself since! This is off topic but I wonder if you painted your stairway bannister and if so, what paint brand and color did you use. It is fabulous! And the contrast with your carpeting, wall color and painting is super sharp! 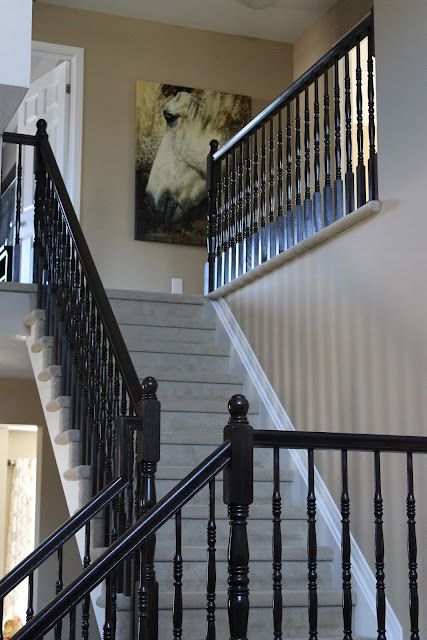 Thank you for the compliments on the horse painting and the railing! The stair railing is actually stained. Unfortunately, I don't know the brand or colour of the stain. It was colour-matched by our builder to the hardwood that we selected (and because of this it isn't in our paperwork for the upgrades for this home either). It may look black in the pictures, but it is a deep espresso brown. Sorry I couldn't be of more assistance with this, but if you select something in the espresso family it should look similar.